If you’ve never had fava beans before, you’re seriously missing out on a seasonal treat that’s only available around this time of year. 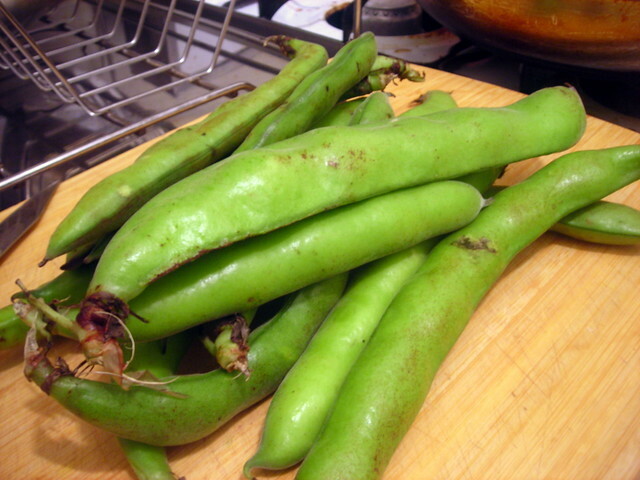 Fresh fava beans are a hallmark of spring. Their appearance sets the stage for a different kind of cooking, where the heaviness and stodginess of winter stews and soups gives way to a lightness that seems like a breath of fresh air. Young fava beans demand a gentle touch, such as a ragout with tomato and oregano, or a risotto with peas and leeks. Older, more mature beans (which arrive later in the season) are perfect mashed into a paste, with garlic and lemon and served with slices of toasted Italian bread as crostini. Occasionally, I’ll feature them in salads, like the one pictured below, or this entry from last June, where I’ve paired them with peas, arugula and mint. 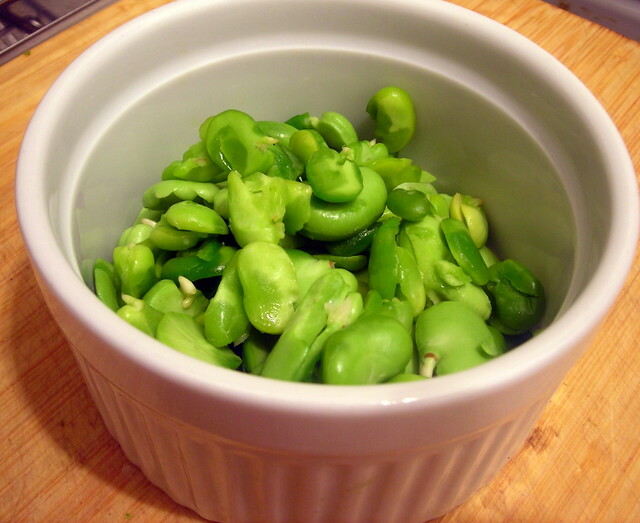 Whichever way you do choose to serve it, make sure you’re using FRESH fava beans, not canned. The difference in taste is immeasurable. If you don’t have any heirloom potatoes (such as the Adirondack Blue potatoes pictured above), you can substitute Yukon Gold potatoes and that will be fine. In a small bowl, combine potatoes, olive oil and 1/4 teaspoon each of sea salt and black pepper. Mix well, then spoon potatoes into a Pyrex baking dish or roasting pan. Roast the potatoes for 35 minutes or until browned. Remove from heat and set aside. Meanwhile, prepare the fava beans. These have to be peeled twice, a fact that may be off-putting to some people and cause them to use canned beans instead. That would be a serious mistake in my opinion, because canned fava beans just do not have the same ‘butteriness’ that fresh fava beans possess. It would be like driving a Volkswagon beetle as opposed to a Cadillac, for example. The easiest way to remove the “skin” is to simmer the beans in lightly salted water for 2-3 minutes, then immediately drain and plunge the beans in ice water. Doing so will halt the cooking and help loosen the endocoat. Lightly squeeze each bean between your thumb and forefinger and the fava beans should slip right out. I won’t lie and tell you this will take 10 minutes to do, because it won’t. It IS a bit time-consuming. 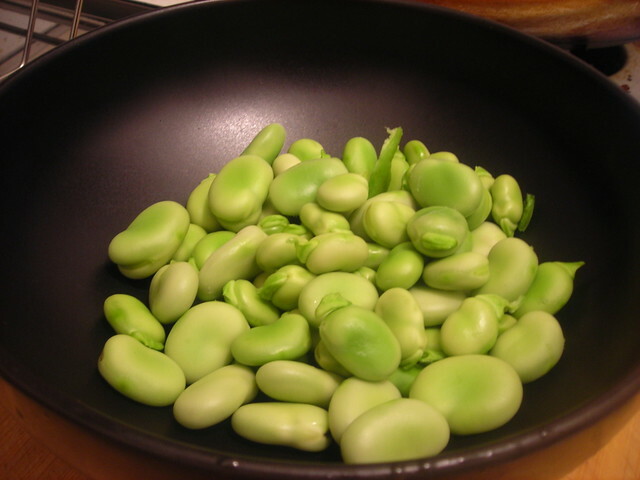 While the yield is indeed small — you’re looking at about 1/4 cup of shelled fava beans, from 1/2 lb. of bean pods — the satisfaction you’ll experience once you taste these beauties makes all the effort worthwhile. Next, prepare the mushrooms. Melt the butter in a large skillet; once the butter begins to foam, add the chanterelles, garlic and a pinch of salt to the pan. Sauté the mushrooms until they begin to brown and are tender, about 5 to 6 minutes. Stir in the fava beans. Cook for 1-2 minutes more. Taste for salt and pepper, stir in parsley, then remove from heat. If you like, you can serve this with a poached egg. Click here for a brief demo. Spoon potatoes onto a salad plate or shallow salad bowl. Top with chanterelle mushroom mixture. Top with a poached egg, then serve at once. This recipe is sized for one person. 22 Apr	This entry was published on April 22, 2013 at 7:46 pm. 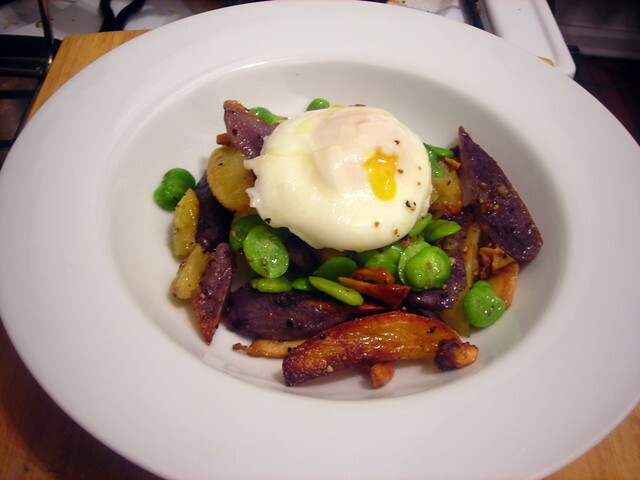 It’s filed under food, food photography, Gluten-Free, spring, vegetarian and tagged chanterelle mushrooms, fava beans, food photography, gluten-free, potatoes, salad, spring, vegetarian. Bookmark the permalink. Follow any comments here with the RSS feed for this post. Thank you Stash…good recipe. You have been missed. Welcome back. Welcome back….good to see you. I’m all about the one person servings! ….and fresh ingredients….. and poached eggs! Total package. I will have to try this one out. Thanks for sharing! I keep forgetting just how many people cook for one. Must take note of that.